If this turns out to be your first all-mahogany acoustic, you won't regret your purchase. Represents excellent value for money. Loud and full tone. Fishman Presys system works well. Lacks a little amplified bass response. 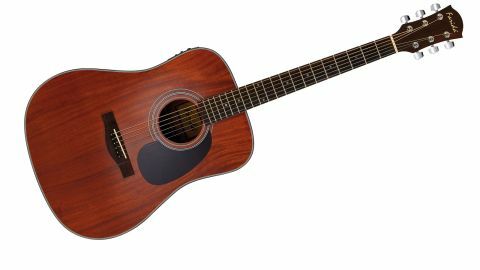 Farida produces a good number of dreadnoughts and, with a body depth a shade over 96mm (3.78 inches), the D-15E is a tad narrower than this reviewer's stock Takamine dreadnought. The mahogany glints invitingly beneath the gloss finish and the back and sides are of laminated mahogany and the inner construction is tidy and clean. "The tone, both acoustically and electrically, is loud and full, with the emphasis on high-mids and treble"
Another feature is a 43mm (1.69-inch) nut made from PPS plastic, and the mahogany neck's profile is comfortable and eminently playable. The tone, both acoustically and electrically, is loud and full, with the emphasis on high-mids and treble. Initially, we found that the amplified bass response wasn't quite as fat as we'd expected, but we easily addressed this issue by setting the Fishman preamp's blend just left of centre, engaging the phase button and adjusting the EQ to our preference. This sort of fine-tuning is all part of being a modern acoustic player, after all, and the Presys Blend system always has your back, especially with the addition of an onboard tuner. Acoustically, the D-15E performs well with fingerstyle pieces, again, benefitting from the mahogany's warmth. Conversely, the attack of a pick helps notes to cut through the mix, and the overall balance and well-rounded character of the tone should provide you with inspiration to keep on playing. At just a groat under £400, the D-15E is certainly not a guitar to be sniffed at.